RSNA 2015 had a certain workaday quality about it—but, I think, in a good way. The 100th anniversary edition didn't feature a big, new scanner starring in the exhibit hall; there was no headline-grabbing major study that dominated discussions. 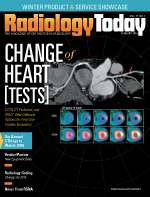 Radiology Today's annual look at things to watch in the coming year reflects that vibe. Health care reform is ongoing, so imagers had better keep working at making it work in the changing environment. Efficient workflow is important; work at improving it. ICD-10 is here, so adapt to it to get paid. How will imagers manage day-to-day screening programs? New things always crop up in imaging—figure out where they fit in and how to make them work. Not much sizzle there, but certainly steak in the imaging world. So with that in mind, here are our five things to watch in 2016. 1. Workflow. No matter what challenges health care faces, efficient workflow helps meet them. While imagers aren't always clear on what defines value in providing imaging care, workflow is one significant piece of it. Perhaps it's just a tangible place to start, but workflow tools to improve existing systems were feature in many companies' RSNA offerings. Reporting system developers are adding new tools to provide more readily available information for radiologists reading exams and relevant information to radiology reports for referrers. Those efforts go beyond mere speech recognition. Critical results notification, image sharing, and archiving systems are designed to improve, automate, and/or streamline imaging services. Increasingly, these efforts focus on patient care and satisfaction, not just increasing procedure volume. Screening workflow is another example. As lung cancer screening and dense breast screening programs expand, many imaging organizations are still looking to optimize the workflow in these programs to improve quality care and service in an era of tightening reimbursement. Until the Centers for Medicare & Medicaid Services (CMS) announced that it was postponing its January 1, 2017, deadline for physicians to start ordering advanced imaging studies using clinical decision support (CDS) tools, I wondered how that impending CDS requirement would manifest at RSNA. With the delay announced—and no new deadline provided because CMS doesn't expect to have approved implementation mechanisms in place until mid-2017—CDS seems to have lost much of its urgency. It still will be interesting to see how decision support fits into workflow. In a related matter, it seems radiology benefit management companies are pursuing a role in CDS. The idea that decision support will cut them out of the picture is a widely held hope among imaging providers. The extent that will come to pass remains to be seen. 2. Cone beam CT. After 13 RSNA meetings, I don't often find myself wondering what's that modality when I see something on the show floor. That happened a couple times at McCormick Place at RSNA 2015. It turns out the answer was usually cone beam CT. Several manufacturers showed new—some approved, some works in progress—cone beam CT systems at RSNA. Standalone systems such as Carestream Health's investigational cone beam CT system are designed for extremity imaging. The system looks like someone tipped over a small, portable CT scanner, then took a bite out of the ring. Actually, the opening is designed to allow easy access for a standing, weight-bearing exam. The system then closes around the leg to allow the detector's 270-degree rotation around the leg. Add the long, metal handles to help a patient balance and you have what looks like no other specialty system. Planmed's Verity cone beam CT system is another specialized cone beam system designed for extremity and maxillofacial imaging. These new systems are a different iteration of the cone beam CT systems developed for and used in high-end IR and angiography procedures and are largely designed for extremity imaging. I certainly don't know whether they'll become widely used or remain niche products, but that's why they bear watching in 2016 and beyond. 3. Hybrid X-ray systems. Taking the opposite approach to those specialty cone beam CT systems just mentioned, several vendors showed new all-in-one X-ray systems that use digital flat panel technology to combine radiography, fluoroscopy, angiography, and 3D imaging into one system. Siemens Multitom Rax is one such system designed to put great flexibility into one imaging suite. Toshiba showed its Ultimax-i FPD to serve a similar space. The names Multitom Rax and Ultimax both might sound like Autobots that might be doing battle with Megatron. The systems seem to start with either a radiography- or angiography-based system and then add additional imaging capabilities of a multifunction system, including 3D imaging capability. I'll be curious to see whether these multifunction systems find their places in different imaging settings. 4. Imaging outside the radiology department. Over the past decade, freestanding imaging center activity slowed its growth and began contracting as economic trends pushed more imaging back into the hospital imaging departments. However, the growing number of specialty imaging systems on display and stories of other—albeit modest—imaging opportunities popping up bear watching. Several RSNA discussions mentioned the growth of imaging in urgent care center environments, including orthopedic and pediatric specialty urgent care centers that are positioning themselves as lower-cost alternatives to hospital emergency departments for complete care. Onsite imaging offers the opportunity for urgent care and medical practices to go beyond evening or weekend office hours and provide complete care for more injuries and illness. It's an attractive, economic, patient-centric alternative to emergency department care. Somebody has to read those images and it might provide a modest opportunity for a forward-thinking radiology group. I do wonder how the hospital you read for might respond to your group reading for an urgent center they don't own and that is competing with their emergency department. Radiology groups still want to stay aligned with the hospitals they serve as the value-based care mindset permeates health care; working with your hospital group's competitors could threaten such partnerships. It will be interesting to see how this segment of imaging services will evolve in light of growing emphasis on patient-centric and value-based care. 5. ICD-10 implementation. October 1, 2015, was the implementation date, so by the time of RSNA there wasn't enough time or data on how the transition to the new coding rules is affecting radiology. There hasn't been nationwide wailing about the dramatic impact of ICD-10 on reimbursement, but it's far too soon to declare a smooth transition and go home. I've heard stories of some radiology billing companies delaying claims over ICD-10 issues and slowing payments that way, but only in some cases. Certainly the first quarter of 2016 will be worth watching to see how the change to ICD-10 will impact the revenue cycle in imaging organizations. Proper preparation and training may well have averted immediate disasters in the transition—and places that did a poor job probably aren't advertising that fact—but it's still too early to have much of a handle on how payers and providers may be affected by the change. How much of a slowdown will there be? How long will it last? Will many advisors' recommendations to obtain additional lines of credit to support cash flow prove to be a lifesaver or just a precaution? We'll start to get better answers to those questions in in the first quarter of 2016. While the ICD-10 transition is a broad health care issue and not a truly radiology-specific one, you can't ignore major changes in the rules regarding how imaging facilities are paid.